Yeah, maybe I went overboard with the butter, but maybe not. Last week we prepared this dish because we now have a source for delicious organ meats, including bison heart, bison liver, and sweetbreads (beef). Heart has always been a favorite. It can be added to any meats you grind at home to add depth and richness to the meat or sausages you might make. Some people are cautious about using heart because it is high in cholesterol, but based on calories and protein, it is right there with white meat chicken (95 calories, 15 grams of protein for a 3-oz. serving). Heart is very high in Vitamin B-12 and very low in fat. For those monitoring iron intake, a 3-oz. serving provides half the DRI of iron for men, and 22 percent of the DRI for women. Eaten by itself, it can be a bit strong. I like to soak my fresh venison hearts in water for 24 hours to remove the blood clots, then slice thin and toss on the grill for a couple minutes, topped with smoked sea salt. How do you like your heart? Trim off obvious silver skin from heart, as well as any blood clots or arteries. In a blender or VitaMix, combine beef broth, mustard, garlic cloves, tomato paste, Italian seasoning, cherry tomatoes, and coconut aminos. Blend until smooth. Cut your heart pieces small to make them easier to chew, especially if serving to children. In a Crockpot or slow cooker, place vegetables and the bay leaf. Place meats on top (alternatively, you can brown the ground meats for a few minutes on the stovetop to bring out a bit more flavor). Now pour your tomato puree over the meat/vegetables. Set the slow cooker to LOW for 6 to 8 hours, or HIGH for 4 to 6 hours, and cover to cook. Serve the Bison Heart Stew hot with a pat of butter. If you have any fresh herbs around, feel free to chop and add those to the bowls as well. Hello dear readers and eaters. It has been a while but you have not been forgotten. As life does, it got in the way, but only in the best of ways. We added to our growing family, a son born in late November 2012. So this last year has been busy changing diapers and now chasing little scampering feet around the house. But I've also been doing all the fun stuff: hunting, fishing, foraging, and eating. In fact, I've been invigorated by some new reading materials, new sources for new meats, and potential for some pretty darn cool adventures in 2014. So stay tuned! Also, with the exception of beer, I've gone "paleo" in my life, so expect some awesome recipes that truly highlight the hunter/gatherer in all of us and showcase the simple, whole foods that are plants and animals. Right now, though, I'm off to prepare some Bison Heart Stew, which will be my first recipe of 2014 published shortly. Every cook worth his/her salt needs a good rub every once in a while. That's why we have a new "old standby" meat rub for venison (works well for lamb too). It's quick and easy! Coat venison steaks or roast in olive oil. In a separate bowl combine meat rub ingredients. Apply liberally onto venison before grilling. Best when venison is cooked on high heat allowing a nice sear. 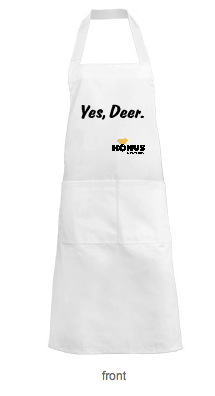 Konus Kitchen launched a Facebook giveaway today to offer five winners the chance to land Camp Chef appliances and other prizes. As the featured wild game chef, Ryan Newhouse and Cooked Animals offered up an all-time favorite recipe, Venison Rindsrouladen. To have a chance at winning a Camp Chef Dutch Oven or Camp Chef Skillet, simple visit the Konus Kitchen Sweepstakes page and enter your name and email address (October 8-14, 2012). No purchase necessary. All chosen winners will also receive a Konus Kitchen apron and pickling spices. Konus Optics are the makers of fine sporting optics for the active outdoors-person. Stay tuned next month for a full review of the M-30 10-40x52 rifle scope as we take it on an antelope hunt in Central Montana! *Recipe photo courtesy Chris Chapman Photography. There is almost no better-tasting fish than freshly caught wild salmon, and there are just about as many ways to prepare it as there are those that catch this delicious fish. This recipe, however, is a great way to bring out the full flavor of the fish, and it’s relatively easy to prepare. Preheat your oven to 400°F. First, you’ll want to prepare the potatoes. Wash the potatoes and place them in a large pot, then cover with cold water. The water level should be about an inch above the top of the potatoes. Bring the potatoes to a boil on high heat and then reduce the heat to medium-high. Let the potatoes cook for about 12 more minutes, until they are just about done, but not quite. Drain them and let them cool, then slice them in half and set aside. Next, melt your butter with the canola oil in a heavy skillet, preferably cast iron. Sprinkle the salmon fillets on both sides with salt and pepper and then place them flat side up into the skillet. Cook this side until brown, approximately 4 minutes, then flip the fillets and brown the other side for about 2 minutes. 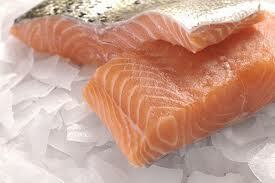 Carefully remove the salmon fillets from the skillet and place them flat side down into a large baking dish. Arrange the potato halves around the filets. Take a large saucepan and combine the chopped shallots, wine, and vinegar. Bring this to a boil then reduce the heat to medium high and allow it to reduce until there is approximately 1 cup of sauce remaining. At this point add the mustard, tarragon, and chicken broth to the pan and increase the heat until the sauce just begins to boil again. Remove the sauce from the heat immediately and pour it over the salmon and potatoes. Place the salmon in the oven and allow it to bake for around 20 minutes, until the salmon is just cooked through. 5 minutes before the salmon will be done, take another large heavy pot and heat the olive oil. Add half of your spinach to the pot and stir gently until the leaves are just wilted, approximately 3 minutes. At this point add the rest of the spinach and toss it until it too is just to the wilting point. Remove immediately from the heat to prevent over-wilting. Serve the salmon on top of the wilted spinach, or separately, whichever you prefer. Some extra tarragon sprigs can be used for garnish if you like, and don’t forget to top the salmon fillets with the wonderful sauce that it was baked in. So I'm giving some serious thought to going after some spring black bear. It's edible. I'll keep you posted. Black bear is a very lean and flavorful meat when cooked properly. This recipe may look a little complicated, but as almost all of the measurements are approximate, this is something that can be cooked at camp or at home. As with all great recipes, the amount of the ingredients that you use can be tailored to your own particular tastes without sacrificing the outcome. 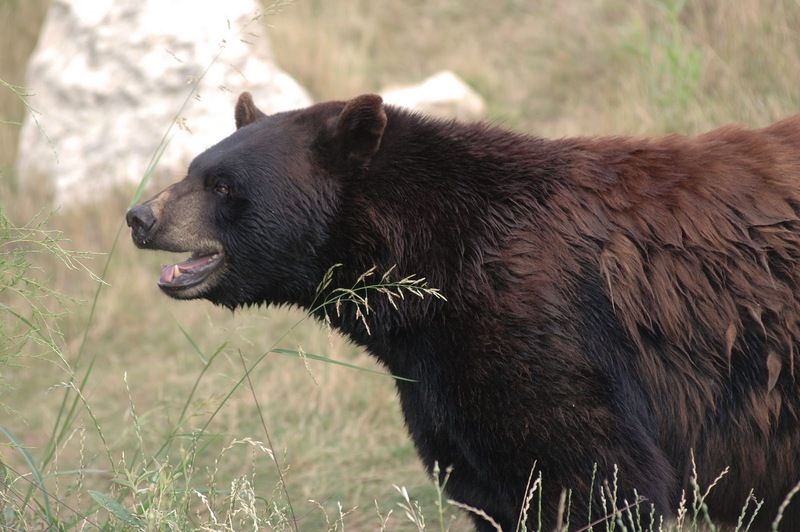 A word of warning, bear meat must always be cooked absolutely thoroughly or any parasites (trichinosis) that are in the meat could make you very ill. Bears caught in the fall are said to have fewer parasites than those caught in the spring, but I'm looking into that further. To start you will want to marinate the roast by placing it in a large plastic bag or a covered bowl with the wine, olive oil, onion, garlic, carrot and tarragon. Refrigerate for about 24 hours, turning often. When ready to cook, discard the marinade and rub the roast with approximately ¼ cup of the flour (more as needed), dried mustard, and about a stick of butter. Make sure you have a large thick bottomed pan with a rack that’s approximately 2 inches above the bottom of the pan, and add about an inch of water to the pan. Preheat the oven to 425 degrees and place the roast on a rack in your pan. You’ll roast the meat for approximately 30 minutes and then reduce your heat to 325 and continue to roast for another 3 to 3 ½ hours. Do NOT baste during the roasting and NEVER undercook bear meat. The meat should be “fall off the bone” tender when done. Reserve the pan juices for gravy. To prepare the gravy, bring the reserved pan juices to a medium boil in a heavy pot on stovetop. Add 3 T. of butter, the green onions, and soy sauce, then stir until the butter is melted. Mix ¼ c. of flour with tepid to warm water. Slowly and gradually whisk in the flour mixture until the gravy thickens. Now stir in the heavy cream and 1 c. of scotch or more as your taste allows. Carve your roast into slices approximately ¼ inch thick and pour the gravy over the meat. The roast can be served with a green salad and rolls as a side, or any light crispy vegetable that you have in season and on hand. If you haven't caught one of the first two episodes of "MeatEater," which airs Sundays at 9 PM ET/PT on the Sportsman Channel, you might want to rethink your priorities in life. I'm personally very happy to see Steve back on TV after finishing up "The Wild Within" series on the Travel Channel. On "MeatEater," Steve more fully integrates the strains and gains we seek out when we're hunting. Yes, it's still about eating what we hunt, but in this show that part's not as heavy-handed as it was in "The Wild Within." The "MeatEater" hammers home the grunt work involved in finding, stalking and taking game in order to experience a strip of black bear loin deep-fried in its own blueberry-stuffed fat. In the opening monologue of "MeatEater," Steve says, "I hunt to live and I live to hunt." This lifestyle we live really boils down to this simple symmetry. We who hunt take full ownership of how we spend our lives and what we feed our bodies. We don't do it for unsung glory or so we can preach on the street corners while we hold a sign that says, "Give P(ieces of Meat) a Chance". We do it so we can share our stories and our dishes with our friends and family, especially our sons and daughters, so they understand that the big world out there is our home, and it can provide for us as long as we go out and pay it a visit every once in a while. Have you watched "MeatEater" yet? Let me know your thoughts below. 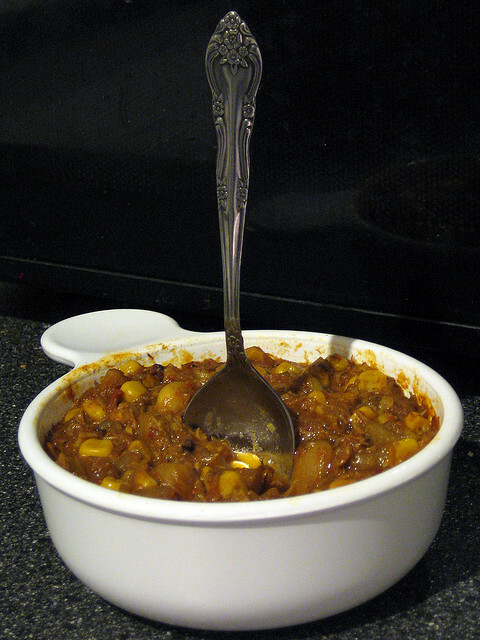 Brunswick stew is a legendary food of the southeast, with origins dating back at least 200 years. Although the exact place of origin is hotly contested among southern states, it remains the quintessential symbol of home and is a staple at barbeques, church socials, picnics, and pretty much any gathering in many states. The people of Virginia contend that its origins stem from an 1828 political rally held for Andrew Jackson, where the host served up a giant batch of the stew, a favorite meal of his on hunting trips. In this version of history, the creation of Brunswick stew is attributed to Mr. Jimmy Matthews, the long-time cook of the rally’s host, Dr. Creed Haskins. According to Virginia lore, however, the stew was such a hit that it was copied and adapted extensively by the attendees of tat rally and quickly spread from county to county, and eventually across state lines. In my version of the recipe, any type of wild game can be used. 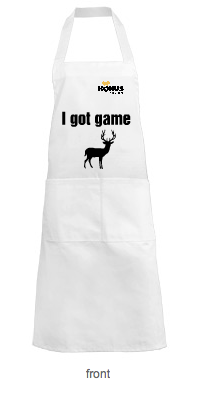 Usually the stew is made with venison, squirrel, or rabbit, but other wild game can be substituted as well. Overall, it’s a relatively simple dish to make, and a delicious meal can be created using small game or venison. The stew is very adaptable and forgiving, so it’s a great way to have fun experimenting with different game. 1 can (28 oz.) diced tomatoes, including liquid. First season the meat (or meats) with paprika and set aside. Using a large saucepan or stock pot, heat the butter on medium to medium-high. Add the meat and brown on all sides, stirring constantly. Next add the sliced onions and green pepper, cooking until the onion is transparent. When the onion is done, immediately add the water, tomatoes (include the liquid from the can), parsley, Worcestershire, and hot sauce. Stir and raise the heat slightly to bring the mixture to a boil. When the stew has reached a full boil, lower the heat to simmer, cover the pot and let it simmer for about 30 minutes. At this point stir in the corn and lima beans and let simmer for another 20 minutes. Blend the 3 T. of flour with a little cold water and slowly stir the mixture into the stew. Make sure to add this a little at a time to avoid clumping. The purpose of the flour mixture is to thicken the soup into a true stew. Cook the stew for 10 more minutes. If you find the stew is too watery or hasn’t thickened properly, you can always leave the lid off of the pot for a while so it cooks down a bit.